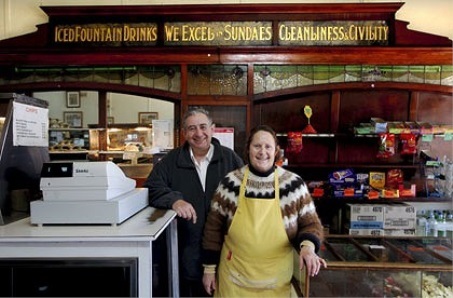 ‘Living history… Angelo and Margaret Pippos continue the Café De Luxe’s tradition of serving Brewarrina for 84 years.’ Photo: Edwina Pickles, from Saffron Howden’s ‘Brewarrina without Café De Luxe would be a Greek tragedy’, The Land, 23 August 2010. According to ABC news on twitter this morning, the legendary Café De-Luxe, in Brewarrina’s main street, has burned down. A 2010 article from The Land made the point that Brewarrina without this café would be a tragedy, but alas, it has come to pass. I spent a week in Bre during the 2000 Olympics, and had a chocolate milkshake every day at Café De-Luxe. The vaulted fibro interior of the café was cool and inviting in a town that, even in early September, was stinking hot. It’s terribly sad to think that the ornate bar, the display cabinets and the precious silverware, accumulated over nearly 90 years of continuous service of ice cream sundaes, is all gone. 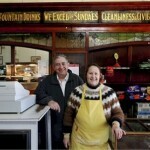 What a loss for the Pippos family and the township, and for lovers of Greek cafés everywhere. Leonard Janiszewski and Effy Alexakis at Macquarie University have done beautiful exhibitions and a book documenting Greek cafés, including this one, but it’s not quite the same as being in the real, atmospheric, deal. Every time we lose one of these rare survivors, it really is a tragedy.